Fitness Test (PFT), Written test and Adaptability Tests for this IAF Airmen Recruitment Rally at Siddipet, Telangana. For this Siddipet IAF recruitment rally candidates belongs to Telangana State only eligible to attend rally. Siddipet Indian Air Force Recruitment rally will be held from 22-12-2018 to 26-12-2018. District wise Indian Air Force Siddipet Airmen recruitment rally details are updated in important dates section. At first Physical tests will be conducted. PFT qualified candidates have to attend the Written test and then adaptability test. 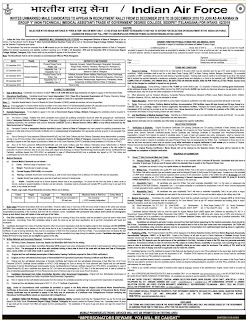 More details about this Indian Air Force Siddipet Airmen Recruitment Rally Telangana qualification, PFT details Exam Syllabus, Model Paper is given below. There are number vacancies available in IAF under Telangana state quota for this Siddipet Recruitment Rally. For Airmen posts intermediate Physics, Chemistry, Biology and English subjects studied candidates are eligible to apply. Minimum 50% of marks having candidates only eligible to apply for this Indian Air Force Siddipet Rally. Candidates will be selected through physical tests PFT, written test, adaptability and medical test. 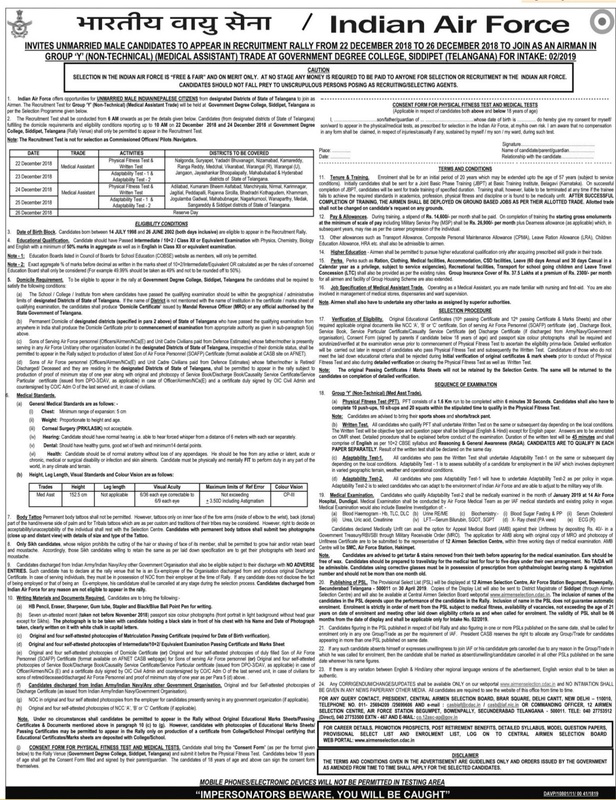 Height: For Airmen GD, Airmen Tradesman and Clerk/storekeeper jobs is 160 cms and for all other 157 cms. 1.6 kms Running to be completed in 5 min 40 sec. For Airmen Group Y Non Technical and Nursing Assistant written duration 45 minutes. 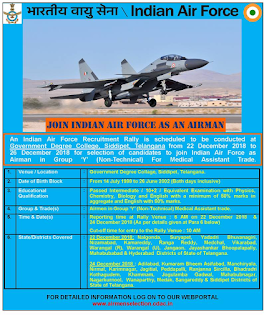 Candidates who are interested to serve for IAF Airmen jobs and within the age limit, they can attend the Recruitment Rally as per given dates of district wise.